Home | News & Media | Speeches | What kind of world will we leave our grandchildren? What kind of world will we leave our grandchildren? 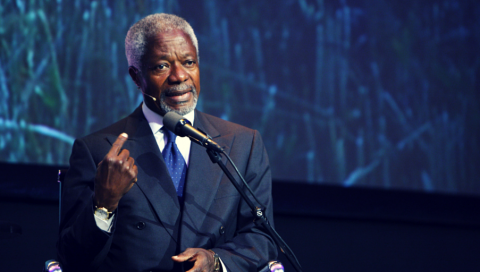 At the “Sommet of Conscience” held today in Paris, Kofi Annan calls on the citizens of the world to show leadership to confront the climate crisis whenever leaders fail to do. Monsieur le Président de la République, Votre Majesté, Votre Altesse, Mesdames et Messieurs. I am deeply honored to join you today at this Summit of Conscience, which comes just a few months ahead of the UN Climate Summit here in Paris. Allow me Mr. President, to warmly commend you as well as His Majesty and His Highness for the leadership you are demonstrating on the existential issue of our time: the real and present danger of climate change. A few months ago, I was greatly blessed by the birth of a third grandchild. His arrival caused me to reflect on the world as I have known it and how it may look by the time he reaches my age. It was a sobering moment. I know that if action is not taken immediately to stop and reverse current climate trends, my grandson will live in a world where the average global temperature could be several degrees higher than when I was a child. The result will be suffocating heat waves, severe droughts, disastrous floods, and devastating wildfires. Entire regions would experience a catastrophic decline in food production. Glaciers and ice sheets would disappear, leading to rising sea levels – drowning cities such as New York or Venice and small island states. This brings to mind what Nikita Khrushchev said when reflecting on the impact of a potential nuclear war: “the living will envy the dead”. We are close to reaching the tipping point beyond which man-made climate change risks denying my grandson and his generation the right to a healthy and sustainable planet. This is not science fiction. But it is not too late to take action. Climate change is a challenge, which can and should be confronted. The history of humanity is a story of ingenuity when faced by grave threats. We already have success stories to inspire us. In the 1980s, when satellite photos revealed a massive hole in the ozone layer, the nations of the world came together and took swift and decisive action. Thanks to the adoption of the Montreal Protocol in 1987, which phased out ozone-depleting substances, humanity avoided the worst. We found better ways to power our fridges and air-conditioners. We invented aerosols that were less harmful. We used fiscal measures in rich countries and development aid for the poorer ones to help make the transition possible. Scientists now confirm that the giant hole in Earth’s ozone layer is slowly recovering. So change can happen: provided there is the political will to push for it. I am heartened to see that relatively few people now question the science of climate change – thanks in large part to the work of the IPCC. But for COP21 to succeed here in Paris, we must go beyond the science. We have to secure a global consensus with realistic targets for emissions control. So I welcome the recent commitment of the G7 to make deep cuts in emissions and to gradually phase out fossil fuels. I hope all countries will come to Paris in November with similar intentions. We must adopt action policies to decouple economic growth from the ever greater use of coal, oil and gas and ensure a faster shift to renewable energy sources. This will require carbon pricing and the phasing out of fossil fuel subsidies. However, as was the case with the Montreal Protocol, the wealthier countries must provide financial resources and technologies to aid poorer countries to cut emissions and adapt to the impact of climate change. Specifically, developed countries must deliver on their commitment to mobilise annually $100 billion for the Green Climate Fund. We must not forget that Africa can and has to be part of the solution to climate change. Africa is already experiencing the damaging impact of climate change; yet no region has done less to contribute to global warming than Africa. In 2012, Sub-Saharan Africa – without South Africa – emitted only 2 per cent of total global greenhouse gas emissions. If left unchecked, climate change will turn vast areas of productive land in Africa into dust bowls, creating widespread hunger and mass displacement of rural populations. Increased competition over arable land and fresh water is already creating conflict amongst local communities and provoking tensions between states. But by tapping into its vast potential of renewable energy, Africa can boost economic growth, create jobs, and avoid the high-carbon pathway that has brought the world to the brink of catastrophe. I want to stress, however, that the solution to the climate crisis, in Africa and elsewhere, cannot be left to governments alone. It requires the active participation of individuals, civil society, and businesses. Thankfully, we are seeing promising examples of such leadership. Companies are now shifting away from fossil fuels to renewable energy and are driving research, innovation and investment to facilitate the transition to a green economy. Six of Europe’s largest oil and gas companies have recently called on governments to introduce a global carbon pricing system. Major airlines are investing in environment-friendly fuels generated from farm waste and animal fats. The successful “Autolib” electric car-sharing scheme here in Paris is another example of how the private sector can develop green alternatives and contribute to cutting air pollution. Civil society groups are launching worldwide campaigns for climate justice and putting pressure on businesses and governments to meet their responsibilities. And, as individuals, we can support these efforts through our own actions. Each of us can for example use energy efficient light bulbs, power down our electronic devices, and recycle waste. It may not seem like much, but it all adds up. Excellency’s, Ladies and Gentlemen. Climate change is the ultimate, most emblematic challenge in this age of globalisation. For the sake of our grandchildren, we cannot refuse that challenge. We have the duty to bequeath to them a world where all of mankind lives in peace and harmony with nature. As an African proverb says: the earth is not ours, it is a treasure we hold in trust for our children and grand-children. We must be worthy of that trust. Let us develop a global conscience, based on the well-being of our planet, that transcends national boundaries, and group or self-interest. Every nation and every individual, working together, must strive to defeat the threat of global warming. We can succeed but it would require sustained and determined leadership. Allow me to conclude by reminding us that when leaders fail to lead, the people will lead and make them follow. Look around you, the signs are there: from country to country, people are taking the lead and demanding change. In good conscience, we must not fail them. Thank you.